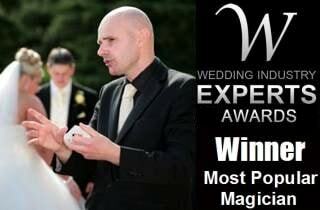 Looking for a wedding entertainer who will leave your guests spellbound? Look no further, David Fox is the perfect choice. If you wish to make that special occasion or party a day to remember.. you have come to the right place. The finesse of David's magic will leave a lasting impression with guests at your corporate function or promotional event. Do you want exceptional magical entertainment in the Newark area? David Fox is the ideal entertainer for your next important wedding, party or corporate event in and around the historical town of Newark-on-Trent. David recently fascinated everyone present at a corporate function for British Waterways at The Moorings Bar on Castle Gate in Newark town centre. His exquisite array of card effects, illusions and sleight-of-hand routines are certain to liven up the proceedings at your next special event around east Nottinghamshire. Indeed, the man voted the 'Most Popular Wedding Magician' of 2014 also amazed a wedding audience in Balderton Village Centre, Coronation Street, with a fantastic stage show and colourful demonstration of his balloon modelling skills! Guests of all age groups were mesmerised as this master of magic also performed close-up table magic, mix-and-mingle effects and parlour illusions for everyone. To the north of Newark, in the village of Winthorpe, David provided a customised 'Harry Potter' style magical birthday extravaganza for a group of 12 year old children. It certainly was a day to remember and is testimony to his flexibility, experience and profound knowledge of the mysterious magical art! 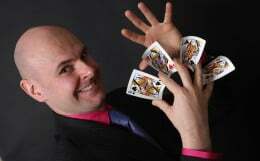 Book magician David Fox today for your next special occasion in Newark-on-Trent, Farndon, Balderton or Winthorpe.